Burning chillies can deter elephants from ravaging crops in African and Asian communities, according to a new study involving a University of Stirling researcher. Crop foraging by elephants can destroy a year's supply of food in just one night and, as a result, many of the highly endangered animals are killed in retaliation on a daily basis. It is the main source of conflict between food security and elephant conservation in both Africa and Asia. 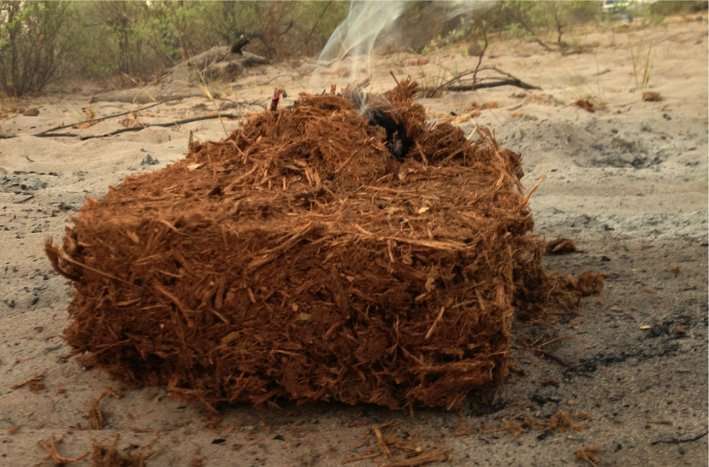 Dr Rocío Pozo, of the University of Stirling, has carried out the first study assessing the effectiveness of burning exclusively chilli-briquettes – made from dung and chillies - in altering elephant behaviour. Dr Pozo was a PhD researcher at the University of Oxford when she conducted the study as part of the Ecoexist Project in Botswana. Significantly, Dr Pozo discovered that burning briquettes during the night triggered a change in elephant movement trajectories – turning them from predominantly nocturnal creatures to diurnal. Dr Pozo, who joined Stirling in September, believes the study, published in Oryx, could help to improve the perception local communities have about elephants and increasing their tolerance towards living with wildlife. She said: "Although chillies have been widely used in areas of elephant crop foraging, this is the first replicated and randomised field experiment to assess the effectiveness of chilli-briquettes in altering space-use and behaviour in Africa. "Our findings suggest that, within a period of two weeks, elephants identified the location and time at which the briquettes were smouldering. In response, they modified their spatiotemporal behaviour to cross chilli sites either before or after the presence of chilli smoke. "Once the chilli-briquettes were removed, or exchanged for briquettes without chillies, elephants returned to the sites within a period of 24 hours." She added: "This is an excellent non-lethal and low-cost opportunity for local farmers to keep elephants away from their crops or properties in the short term. However, we hope that it will also provide a long term benefit – by helping to decrease negative perceptions of elephants and therefore combining them with land-use managements in the field." Dr Pozo, from the Faculty of Natural Sciences, was working as an Ecoexist Research Fellow as part of her PhD at the University of Oxford when she conducted the research between the villages of Seronga and Beetsha in the eastern Okavango Panhandle, Botswana, over a five-month period. This area was chosen as it included some of the most populated villages along the Okavango River, which attracts a large number of elephants due to the availability of water. With the help of local assistants, she built and tested more than 600 briquettes – made from a ton of elephant dung and hundreds of kilograms of dried chillies. Once all of the briquettes were dry, the team lit them, according to randomised treatments across 10 experimental sites located along a 30km area. All experimental sites were checked every morning and evening and the number of elephants and the types of herds using the areas were recorded. Camera traps were also used at each site to photograph the exact times at which elephants approached the briquettes with chillies and those without. "All of this gave us a good idea of how efficient chilli-briquettes were at deterring elephants' trajectories in the eastern Panhandle at times when elephants were more likely to be encountered around people's fields and properties," Dr Pozo explained. The approach also has an additional benefit to local farmers as other countries in Africa have showed it by providing extra income thanks to the sale of chillies for other purposes. Significantly, other groups in Africa are now implementing Dr Pozo's chilli-briquette protocol. Can drone technology save the Sumatran elephant?